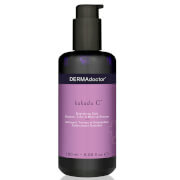 Clean your way to skin protection with Dermalogica UltraCalming Cleanser. Protect your sensitive skin from environmental toxins and soothe from irritation. Lavender has anti-inflammatory properties to help soothe and heal skin. Cleanser will effectively and gently remove makeup from the most sensitive skin without leaving a residue. Ideal for those who want to protect their skin for healthy, youthful looking skin. Apply a small amount to face and massage gel into skin with upward strokes. Rinse skin clean with warm water or dry cotton pads. Use twice daily for best results. A long time user and its very good! I'm a redhead with sensitive skin. I can't use a gel cleanser twice a day because it causes surface dehydration. I have been using this cleanser in the mornings for about sixteen years and and I love it because it keeps my skin balanced and moist. I've used Dermalogica over the course of 2 years. They are good products but not the best. Bought it for friend as a gift. Buying for my friend...great cleanser! This wash is gental and effective. I have combination skin, this face wash works great on all parts of my skin. Once you try this face wash you will never go back to what you were using before. This cleanser is gentle on the skin and does not dry out the skin. Have been using it for 3 years and will continue to use it. Love this product. I made the switch to only cruelty-free products about a year ago and having to change cleansers was tough as my skin is extremely sensitive to cleansers and most break me out. I was hesitant to spend so much money on one, but because Dermalogica is CF I decided to. This cleanser has been the only one I've found that's CF and works for my skin. Gentle, not too drying.. leaves my skin feeling balanced. I love it and always come back to it.